A Thanksgiving day treat from non other than XDA. 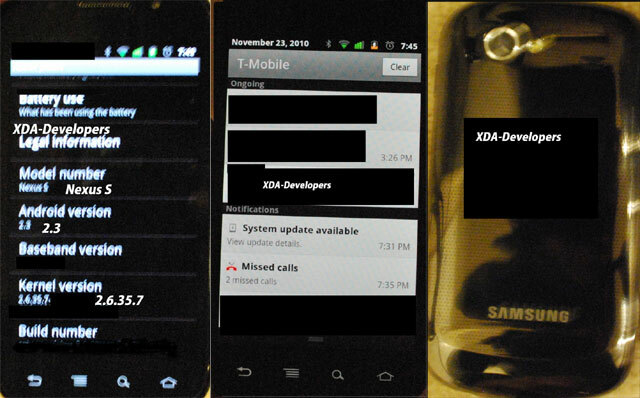 Seems a anonymous source close to XDA has decided to share some news and exclusive picks of the elusive Samsung Nexus S. What’s so special about these photos? Well the finally confirm that it will be running Gingerbread. We also now know that Gingerbread is officially Android 2.3, not the suspected Android 3.o that was rumored. The pictures themselves are a bit blurry, but they are clear enough to make out the important details. The device itself is a very thin, and has a curved design to it. One known feature is a 720p HD capable camera, and it looks to have a 4 inch screen with 800×480 resolution. After some further investigation by XDA, the source has confirmed that the Nexus S is powered by a nasty Dual Core Orion 1GHz CortexA9 processor. Looks like this thing is definitely built for some real speed. It is also speculated that it will come with a new SuperAmoled2 screen, which would really make it stand out. Here’s what the guys at XDA are speculating about the Nexus S.
We have a whole lot more to learn about this new Android bad boy, so stay tuned to Blogsdna. Gingerbread Rumor: Android 2.3 to be Released This Week?